Last year's busy Law FairAs part of its tenth anniversary celebrations, Bangor Law School (Gwynedd) will hold a Law Fair on Wednesday 19th November 2014, from 9.45am to 3.30pm. The aim of the Law Fair is to bring together employers and Bangor law students in an environment which will create mutually beneficial results. 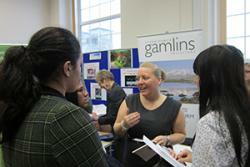 Attendees discuss career options at the Gamlins stand at last year's Law Fair. This year's is expected to be an even larger event.This year’s Law Fair will be even bigger and better than last year’s and is destined to attract a large number of attendees. The Law Fair will feature leading employers such as the law firms, Silverman Sherliker (London), EAD (Liverpool), Hugh James (Cardiff) and Gamlins (North Wales), the well-known barristers’ chambers – Linenhall Chambers – from Chester and Civitas from Cardiff, banks, such as HSBC, Advent Mediation and Gwynedd Probation Service, to name but a few. Besides emphasising traditional legal careers for law graduates (i.e. 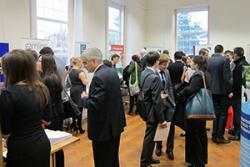 solicitor and barrister), the Law Fair will also helpfully highlight non-traditional career routes for law graduates. Examples include: civil service jobs in the EU institutions (in Brussels, Strasbourg and Luxembourg, principally), the role of legal advisor in the insurance sector and the career of probation officer in the Probation Service. Bangor Law School has truly outperformed over the last number of years, gauged by a number of metrics. 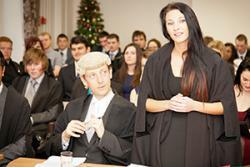 Bangor Law School’s employability score of 94% compares very favourably with the sector average of 61%. The Law School’s three-person Employability Committee ensures a constant ‘pipeline’ of high- A student takes part in a 'Moot Court'. The mock trial at the Law Fair will be conducted Welsh with simultaneous translation provided.end internships and mini-pupillages in law firms and barristers’ chambers respectively. In terms of the most recent National Student Survey (NSS), Bangor Law School was ranked as the Number One law school in Wales and joint 5th in the whole of the UK for overall student satisfaction. Several of the Law School’s academic staff have been National UK Finalists in Major Teaching Awards in recent years. While, last month, the Law School’s new ‘courtroom’, to be used for moot court (mock trial) competitions, was formally opened by the Lord Chief Justice. The Law Fair takes place in Neuadd Reichel, Ffriddoedd Road, Bangor between 9.45am and 3.30pm and will comprise a large exhibition of employer stands, breakout sessions on traditional and non-traditional career options and then workshops in the fields of Land Law and Charities Law. The Fair is open to all students and prospective students, entry is free, but pre-registration is advisable, to do so or for more information or a copy of the programme, please mail Mr Gwilym Owen ( john.g.owen@bangor.ac.uk ) or, Dr Mark Hyland (m.hyland@bangor.ac.uk) .